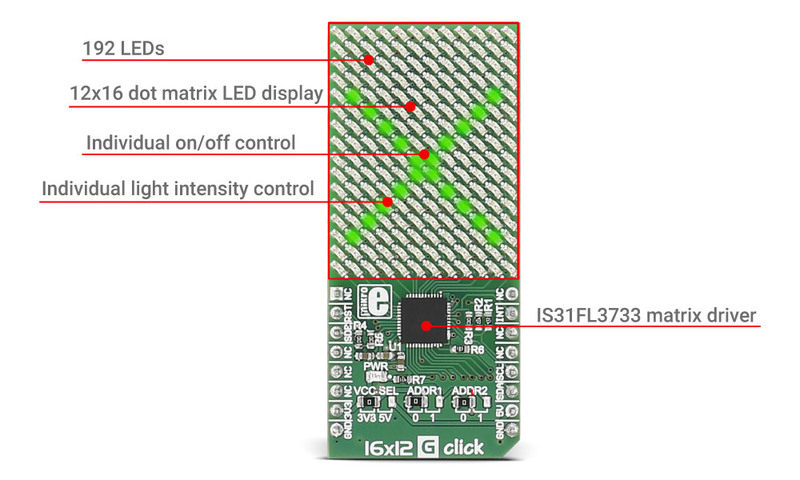 16x12 G click carries a 16x12 LED display and the IS31FL3733 matrix driver. The click is designed to run on either 3.3V or 5V power supply. It communicates with the target microcontroller over I2C interface, and the following pins on the mikroBUS™ line: INT, RST, CS. Each LED can be controlled individually – both for on/off control and light intensity. The IS31FL3733 is a general purpose 12×16 LEDs matrix driver with 1/12 cycle rate. Each of the 192 LEDs can be dimmed individually with 8-bit PWM data, which allows 256 steps of linear dimming. The driver has selectable 3 Auto Breath Modes for each LED ( ABM-1, ABM-2, and ABM-3). Applications Gaming devices, small handheld devices, home appliances, IoT devices, etc.